NEW! Long sleeved shirt with X design! Bold styling with a slashing X on the chest makes this shirt a perfect for your music. NEW! Long sleeved shirt with radical stripes in big-hole mesh. NEW! Pirate shirt for all the ship captains out there! NEW! 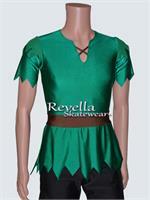 Fly to Neverland in this tunic-styled shirt. NEW! You are all set for adventure in this stylish shirt. NEW! Classic long sleeved shirt with collar. Poets shirt with blousy sleeves. Shirt features a notched neck and stretchy cuffs. Made of regular weight spandex for easy wearing. Great for pirate music, or Zorro music! Basic long sleeved velvet shirt with round neck. Great for testing or just practice. Stretch fabrics provide comfort and ease of movement. Shirt has snap crotch. Basic short sleeved velvet shirt with crew neck. Great for practice or low end competition. Stretch fabrics provide comfort. Go all out and choose a custom color that compliments your personality! Black spandex pants have elastic waistband and elastic boot straps. Velvet ice skating pants. Elastic waistband and elastic boot straps. Get a color to match your ice skating shirt for a complete look. 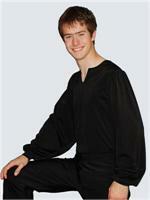 Skating pants shown in black velvet, also available in red velvet, royal blue velvet, gray velvet, and walnut velvet. Boy's ice skating outfits - boy's skating shirts and pants. Lots of colors to choose. We offer high quality boy's ice skating outfits. Choose from a fun selection of boy's skating shirts. If you need a boy's skating shirt custom designed, we are here to help. Our boys' skating shirts can be designed to suit his music and his style. Contact us for your next boy's ice skating shirt or outfit. Choose your style. Choose your color. 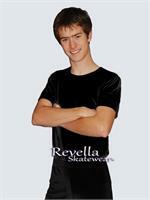 Genuine Revella Skatewear. We offer a wide selection of colors for ice skating outfits, mens' skating shirts, and boys skating outfits. Boys figure skating costumes in great styles and colors. Mens' skating shirts in bold styles and colors. Let our friendly customer service help you get the ice skating outfit you want. It's easy to get the ice skating outfit you want! Any shirt. Any available color. The choice is yours. Revella Skatewear. 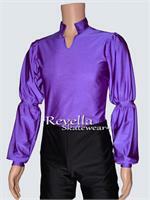 Choose Revella Skatewear for your next competition ice skate outfit.